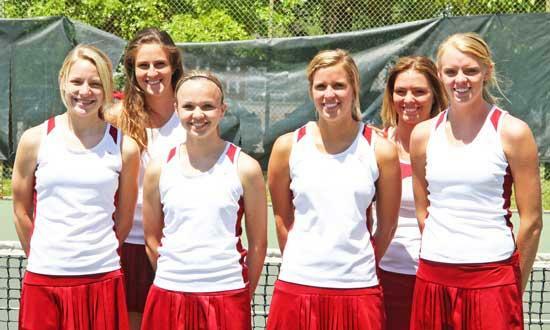 Cannon County's girls tennis team came with a point of capturing the District 8-A/AA Championship before settling for a second-place finish in a narrow 4-3 loss to Friendship Christian in Cookeville Thursday (May 5). The Lionettes turned back Central Magnet 4-1 in the semifinals Wednesday to set up the title match. The boys team beat rival DeKalb County 4-1 in the first round before falling to Livingston Academy, 4-0, in the semifinals. Darci Brandon, Taylor King, Emilee Lance and Jordan Hollis all won their singles matches against Central to pace the easy 4-1 win and set up the championship showdown against Friendship Christian. After dropping the first two points in singles, Cannon County reeled off three straight win to take a 3-2 lead going to doubles. King turned back Haden Neal 6-1, 5-7, 7-6 (7-2) to secure Cannon County's first point. "Taylor played a great match," Cannon County Head Coach Ronnie Burks said. "It may have been her best match. She was strong all-around and really got us going. She gave us a chance to win the championship." Lance evened the match 2-2 with a 6-4, 6-7 (6-8), 6-3 win against Jolin Baker, and Hollis came up big with a 6-0, 6-0 sweep against Madison Kane to provide the Lionettes the lead. King and Katlyn Currie dropped an 8-3 decision to Adrian Ricketts and Neal at No. 1 doubles, and Darci Brandon and Lance fell to Jenna Hazelwood and Baker at No. 2 doubles as Friendship Christian fought back for the narrow win. "I am proud of the girls and the way they battled," Burks said. "They had a chance to win a championship and go to the region. We just came up a little short." The boys team made short work of DeKalb County in the 8-A/AA first-round game. Mitchell Page took a 6-2, 6-3 win at No. 1 singles and then Taylor Blanton and Hunter Brown provided Cannon County a 3-0 lead with straight-set wins at No. 2 and No. 3 singles, respectively. Bobby Fletcher took a straight-set win at No. 5 singles to clinch the 4-1 victory and move the Lions into the semifinals against Livingston Academy. Cannon County wasn't as fortunate in the next round, suffering a shutout against the Wildcats. The individual district tournament is scheduled for Monday and Tuesday (May 9-10) in Cookeville.